Menaggio is a town and comune in the province of Como, Lombardy, northern Italy, located on the western shore of Lake Como at the mouth of the river Senagra.Menaggio has three frazioni (parishes): Croce, Loveno and Nobiallo.HistoryThe area of current Menaggio was conquered by the Romans in 196 BC. Start off your visit on the 1st (Sat): pause for some serene contemplation at S. Giovanni Battista, take in the architecture and atmosphere at Chiesa di San Giorgio, then admire the striking features of Villa Monastero, and finally step into the grandiose world of Castello di Vezio. To find other places to visit, ratings, photos, and more tourist information, use the Menaggio online holiday maker . Newark, USA to Menaggio is an approximately 14.5-hour flight. Due to the time zone difference, you'll lose 6 hours traveling from Newark to Menaggio. On the 1st (Sat), wrap the sightseeing up by early afternoon so you can drive to Cinque Terre. Start off your visit on the 2nd (Sun): tour the pleasant surroundings at Footpath Monterosso - Vernazza, take a stroll around Vernazza, and then tour the pleasant surroundings at Cinque Terre Trails. Keep things going the next day: explore the striking landscape of Parco Nazionale Cinque Terre. For traveler tips, more things to do, reviews, and tourist information, use the Cinque Terre travel route planner. Traveling by car from Menaggio to Cinque Terre takes 4 hours. Alternatively, you can take a train. In September, daytime highs in Cinque Terre are 79°F, while nighttime lows are 59°F. Wrap up your sightseeing on the 4th (Tue) early enough to travel to Capri. For shopping fun, head to Carthusia or Eco Capri. 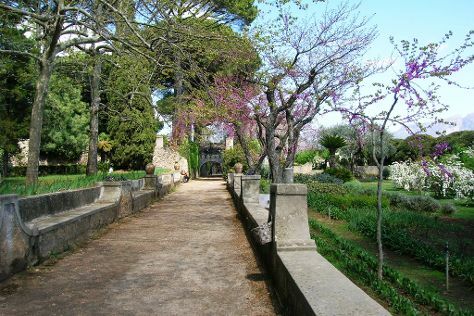 Eschew the tourist crowds and head to Villa San Michele and Monte Solaro. There's much more to do: explore the striking landscape at I Faraglioni, stroll through Marina Piccola, get to know the fascinating history of Scala Fenicia (Phoenician Steps), and don't miss a visit to Piazza Umberto I. For other places to visit, reviews, ratings, and tourist information, you can read our Capri sightseeing planner . You can do a combination of train, flight, and ferry from Cinque Terre to Capri in 6.5 hours. Other options are to do a combination of train and ferry; or do a combination of train, bus, flight, and ferry. Traveling from Cinque Terre in September, plan for a bit warmer nights in Capri, with lows around 69°F. Finish your sightseeing early on the 8th (Sat) so you can ride a ferry to Positano. Kick off your visit on the 8th (Sat): contemplate in the serene atmosphere at Duomo di Sant'Andrea Apostolo, admire the natural beauty at Villa Cimbrone Gardens, admire the striking features of Villa Rufolo, then contemplate the long history of Duomo di Ravello, and finally look for gifts at La Bottega delle Arti. Keep things going the next day: contemplate in the serene atmosphere at Chiesa di Santa Maria Assunta e Cripta Medievale, then stroll through Bagni d'Arienzo, then cool off at Fornillo, and finally stop by Nana' Positano. For maps, more things to do, photos, and tourist information, read Positano road trip planning site . Getting from Capri to Positano by ferry takes about an hour. In September, plan for daily highs up to 82°F, and evening lows to 68°F. Finish your sightseeing early on the 10th (Mon) to allow enough time to drive to Pompeii. On the 10th (Mon), delve into the distant past at Teatro Grande, take in the spiritual surroundings of Sanctuary of the Madonna of the Rosary, steep yourself in history at Villa dei Misteri, then steep yourself in history at Gli Scavi Archeologici di Pompei, and finally delve into the distant past at House of Menander (Casa del Menandro). To see more things to do, where to stay, traveler tips, and more tourist information, go to the Pompeii travel app . Traveling by car from Positano to Pompeii takes an hour. Alternatively, you can do a combination of bus and train. Expect a daytime high around 82°F in September, and nighttime lows around 65°F. Wrap up your sightseeing on the 11th (Tue) early enough to drive to Naples. Naples is the capital of the Italian region Campania and the third-largest municipality in Italy after Rome and Milan. Kick off your visit on the 11th (Tue): steep yourself in history at Underground Naples, then explore the different monuments and memorials at Catacombe di San Gennaro, then delve into the distant past at Ruins of Herculaneum, and finally delve into the distant past at Scavi Archeologici di Ercolano. To find reviews, photos, and tourist information, read our Naples day trip website . Naples is very close to Pompeii. In September, plan for daily highs up to 81°F, and evening lows to 65°F. Wrap up your sightseeing on the 12th (Wed) to allow time to travel to Venice. Eschew the tourist crowds and head to San Giorgio Maggiore and Ponte dell'Accademia. Basilica di San Marco and Peggy Guggenheim Collection will appeal to history buffs. When in Venice, make a side trip to see Scrovegni Chapel in Padua, approximately 42 minutes away. And it doesn't end there: explore the galleries of Porta della Carta, take in the views from Ponte di Rialto, contemplate the waterfront views at Canal Grande, and appreciate the extensive heritage of St. Mark's Square. For reviews, where to stay, photos, and tourist information, you can read our Venice route planning site . You can fly from Naples to Venice in 3 hours. Other options are to take a train; or drive. Expect slightly colder evenings in Venice when traveling from Naples in September, with lows around 60°F. Cap off your sightseeing on the 15th (Sat) early enough to travel back home.